“Tibetan Buddhism is unique among the many schools of Buddhist thought. For centuries, Tibetan Buddhists held esteemed residencies in the great Indian Buddhist Monastic Universities and translated the cream of those Buddhist “Libraries of Alexandria” into a unique collection as well as continuing the oral practice traditions from the great Siddhas during the full flowering of Indic Buddhism from 600 to 1100 CE. The canon of work that emerged from these pursuits addresses some of the most important mysteries that we as humans have always faced– and offers a repository of knowledge that can help us confront the challenges of the modern existential dilemma we are confronting today. But how do we continue to preserve this wisdom, and how do we meet the challenge of keeping these teachings in the forefront of spiritual inquiry for philosophers, thinkers, teachers and spiritual seekers so this knowledge is not lost? This conference seeks to delve into these questions through a series of interviews and lectures with such luminaries as Thupten Jinpa, Robert Thurman, Lama Tsultrim Allione, Tenzin Wangyal Rinpoche, and more. The Foundation of the Sacred Stream has been active in helping preserve Tibetan Buddhism and Tibetan culture for many years. We regularly collaborate with Tenzin Wangyal Rinpoche to raise funds for the Tibetan Association of Northern California (TANC), and the money we raise is earmarked for the education and cultural programs for youth that TANC sponsors. We work closely with Geshe Pema Dorjee, who was the Director of the Dharamsala Children’s Village for many years, to raise funds for at-risk youth in Tibet and Nepal. In 2013, Geshe Thupten Jinpa, His Holiness the Dalai Lama’s principal English language interpreter, asked Sacred Stream to sponsor a year-long U.S. cultural exchange for the monks of the Gaden Shartse Dokhang. We helped them raise awareness about Tibetan Buddhist traditions across the country and to rebuild their monastic halls and dormitories. Through our collaborative workshops with Tibet House US and Menla Mountain Retreat, we provide education about Tibetan Buddhist philosophy to a wide range of modern seekers. 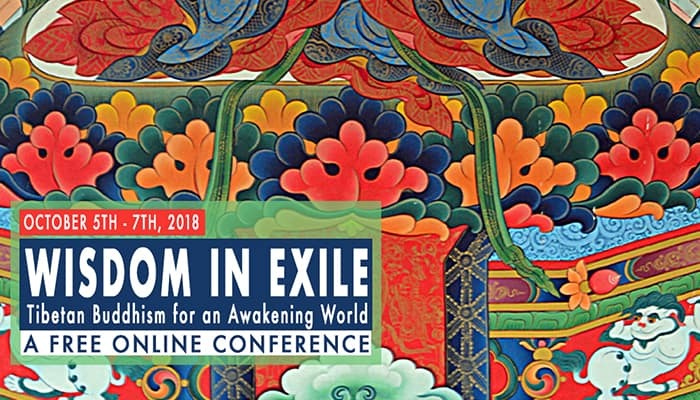 The Wisdom in Exile conference is part of the natural evolution of Sacred Stream’s effort to help support the wisdom of Tibetan Buddhism and the people who are part of the tradition. If you want to register for the conference, you can visit embodiedphilosophy.org/p/exile. If you are not able to join live, you can purchase the program using the same link.